Couples Poses For Wedding Album, that you can’t miss affording is much more of an art than it is “Science”, as it requires so many judgments and interpretations. Most of all couples want to be filled with the most beautiful, romantic and unique photographs. Thus, here we are to help you choose the appropriate poses for you! Hence, down below explore more about these poses that you can’t forget to add in your wedding album! This is the evergreen pose for any couple. An old-fashioned style never fails to impress us because it gives a royal touch to the photography. Obviously, the wedding is the biggest moment for the bride and groom, and this pose captures classic appearance. Well, this most loved “Couples Poses For Wedding Album”, can be changed slightly by giving it a vintage look by getting this photograph in black-&-white format or making the bride and the groom stand instead of groom standing beside the bride. While many photographs will be clicked, but your first dance moves has another charm in it! Hence, don’t forget to add this couple pose in your precious keep-space. 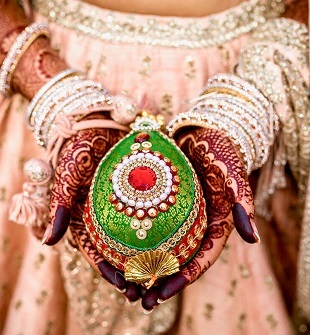 Every girl dreams of a fairy-tale moment at her wedding! It’s no wonder, she wants to look like a princess herself, waiting for her prince charming. Long, floor-length gown, just like Disney princesses dresses up, is somewhat every girl wants to wear before her wedding with her prince proposing her in a most romantic way! 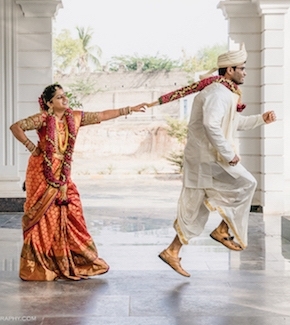 During your wedding, tell your photographer to capture this kind of moment immediately! Lost into each other, talking with the eyes and getting excited for the future together! While everyone is busy for the ceremonies, don’t forget to show your love and affection to your going-to wife in between the rituals and perhaps don’t forget to get it captured because a kiss on the forehead is the symbol of respect for who you are! It’ll remind your promises that you made to each other in your future. This pose is too filmy! But every girl in this world dreams about this proposal in public which shows how much your husband loves you and will do the same even if you get old. A forever-mine kind of filmy proposal pose for the modern couples is definitely needs to be the part of their wedding album! 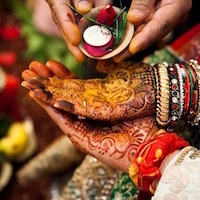 Gone are the days when the wedding vows and rituals were used to be emotional for the bride! Now, it’s time for laughter and fun in-between the rituals as you are going to start a new journey! Add this to your wedding album and a smile will be on your face every time you see this photo! This is one of the extremely precious moments which you can’t forget to add in your wedding album which includes your new beginning together as husband and wife! Let it be the “Saatvan Phera” or the “Sindoor Moment”. Well, as you can see this one is taken among must-have poses. Poses in a wedding-photograph is not about sitting ideally and smiling in front of the camera all day but it’s all about catching up some precious moments that you want to cherish for the lifetime. This kind of photograph adds a natural zing to the album! Your wedding albums must have some of these moments to remind the love between two pure souls who took vows in front of the holy fire to be with each other! Your photographer must be quick enough to click some of your moments,(especially when nobody is watching you two) that comes out naturally, whether it’s looking at your bride’s mehandi design or wiping tears of your soul-mate when she gets emotional during the ceremonies, as I said earlier it adds a natural zing! Hence, these were a few of the must-have, “Couples Poses For Wedding Album” that you can’t wait to add in your wedding albums and want to cherish it for the lifetime!